Besides being a Freemason, Klövekorn is ‘Asatruar’, a “gothi” even. The author was born in Germany, lived in South Africa, but I think it was in Australia (where he still lives) that he started to pursue the path of Asatru. The little book of 226 pages makes a somewhat shallow introduction into the subject. As there are not many writings of contemporary heathens, this is good for people who are looking for first info, but less so for people who hoped for more in depth insides. There are quite a couple of negative things to say about the book. 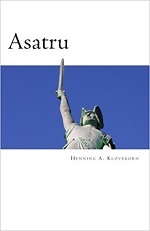 Klövekorn uses the term “Asatru” as a very general term but I do not know if a new reader will know it is but an umbrella term. What always stings me a bit, is that Klövekorn uses the same term to refer to the religion of old. So people who lived centuries back, were also “Asatruars” while the term is only a few decades old. Even Stonehenge is an Asatru monument to Klövekorn, so the generalisation also crosses cultures. Then there is the fact that the author is very loose with his retellings of myths and sagas. Odin made his spear Gungir himself from a branch of Yggdrasil. Eh? Also Odin was blown into the same tree by a strong wind and hung there for nine days head-down. Eh? Oftentimes I have the idea that Klövekorn wrote the book by heart without cross-checking too much. There is also an ‘American lean’. The author names Asatru festive days which includes commemorations of ‘heroes’. I know this happens in the USA, but I have never heard any group from Europe doing that. Klövekorn seems to like to show himself too. There is a “Klövekorn rune alphabet” and there are “Klövekorn Asatru rituals” which include a poem of himself. Especially with the futhark that feels a bit weird. A few ritualistic guidelines may be helpful for people who are new to the field, so this is a good inclusion. I do not see any obvious Masonic influences in the rituals by the way. My last remark, and then I will stop complaining, is that, just as in the other book, there are many typos, spelling errors and general miswritings. Here and there Klövekorn wants to show his German roots by, for example, naming Charlemagne “Karl der Grosse”, but there are also German words contain typos (and why not just write “Karl der Große”, but both spellings are correct, so…). My hope was that the author would say something about the practicing of a ‘Northern hemisphere religion’ on the Southern hemisphere, but that is not the case. It looks like that Klövekorn” as his group practices Yule in the middle of summer, december, sticking to the ‘original dates’. Be all that as it may. With a bit of a critical view, here at least we have a contemporary book on heathenry from a practicing Asatruar. There are too few of these. It is cheap, easy to get from Amazon, available for ereaders and makes a nice read. Just be sure it is not the only book on the subject you read.